For this blog, I’ll assume that you have or will read my January blog, “Fly Fishing, Getting Started“. Hopefully you have had a chance to purchase and try your equipment on a pond as well. The thrust of “Step ll” is to prepare the beginner to take the next step, fly fishing trout streams. To do this safely and effectively does require some equipment beyond the minimal essentials discussed in my previous blog. While the materials used for wading footwear resist degradation from repeated soakings, the primary purpose of footwear is the safety of the wader. The most important component is the sole. Felt is still the most helpful material, providing good traction when stepping on slippery stream bottoms. But seven states do not allow the use of felt (Conservation Controversy- Felts vs. Rubber). Therefore, we also have rubber soled footwear. Unfortunately, rubber does not provide the same degree of traction as felt when wading. So, if buying rubber soled footwear, be sure to also get metal studs. It’s kind of like wading with golf shoes! Rubber soles do offer some advantages if doing a good deal of hiking while fishing. So consider rubber soles if that is your fishing style. Boots are sized to allow for the neoprene booties found on most waders. Hence, if your shoe size is a 10, a size 10 boot should allow room for the waders. If your shoe size falls between a full size, i.e. 10 1/2, get a size larger boot, that is, an 11. 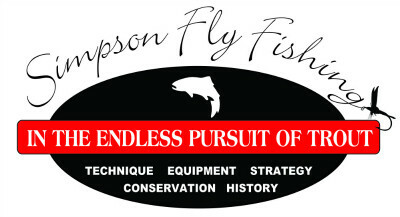 Best of all, visit your local fly shop and try on both boots and waders, just to be sure that they fit comfortably. A too-tight fit is disastrous! If the plan is to fish only in warm water conditions, then wading sandals will suffice. They come with either felt or rubber soles. But if the plan includes trout fishing during cooler parts of the year, then boots and waders are a better choice. Trout live in cold water, ideally 45-65 degrees. Their streams only reach the upper part of that range for a few months in the summer. Consequently, most of the time, the trout angler is wading in cold water, sometimes intolerably cold. So, if you want to remain comfortable while fishing year ’round, waders are a good investment. Waders are made of Gortex or Gortex-like materials. This keeps the water out, but allows some breathability, which helps prevent perspiration. They typically have 2-4 layers of fabric. The more layers, the more durable, but the more $$. Other features to consider include waist-high vs. chest-high design. I no longer wade over my waist, so save a few dollars by purchasing waist-highs. Orvis makes a convertible wader, i.e. the top slides from the chest down to the waist. Some manufacturers, like Simms, offer water-proof zippers. Each feature of course adds to the cost, so make your own selections based on your needs and budget. Lastly, some manufacturers, like Orvis, now make a line of boots and waders designed specifically for women. They are more appropriately fitted, and a bit more fashionable. But be reassured, they still provide the necessary comfort and safety. This set of equipment serves two purposes, protection from the sun, and visualization of the stream bottom. Baseball style hats keep the sun from one’s eyes, which is quite helpful. But a western style hat protects the ears and neck from sunburn and skin cancer as well. Make your own choice. Polarized sunglasses remove glare from the water’s surface. This allows the visualization of fish, but more importantly, the stream bottom. Many a fall “into the drink” is prevented by polarized lenses. I prefer lens colors, like yellow or amber, which allow good visualization in the shade, as well as bright sunlight. This helps me search for trout in low-light conditions. A day of fishing requires multiple flies. We never know with certainty which flies will be most effective on any given day, or even time of day. Therefore, we carry flies to imitate different bug species, and different stages of bugs. A healthy selection of dry flies, wet flies, nymphs, emergers and streamers increases the likelihood of having a fruitful day. And did I mention that sometimes we might lose a fly? Next is a set of tools. Nippers, which work and look like nail clippers, snip leaders, tippet, etc. Every time we tie on a fly, extend the leader, or tie other knots, there is a tag which needs to be trimmed. Nippers work better than teeth! 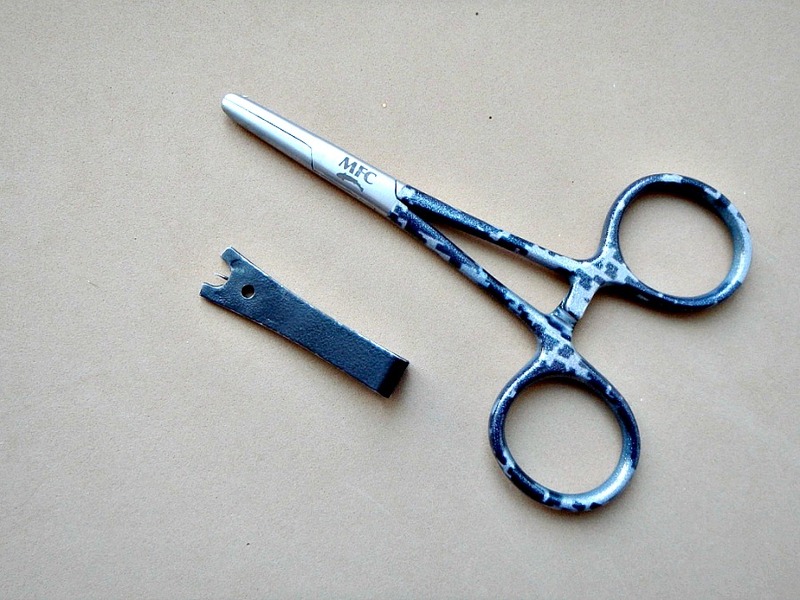 Most nippers also have a small needle, which is used to clear the hook-eye of inadvertent head cement (glue). A hemostat or forceps is useful if a fish is hooked deep in the mouth rather than the lip. The hook can be reached and removed to release the fish unharmed. We also use hemostats to flatten the barbs on hooks, in order to fish “barbless”. This makes releasing fish easier, and is required in many streams. Nets protect the fish! With a net, a fish can be “landed”, released from the hook, and returned to the water more quickly. This avoids tiring the fish too much, and minimizes direct handling of the fish. Prolonged playing of fish, exposure to air, and loss of protective slime from handling, all lead to an increased mortality. Thus nets greatly increase the survival rate of released fish. The best nets have a rubber mesh, which minimizes injury to the fish. A wonderful added benefit of rubber meshes is that hooks don’t get caught in them. This is particularly helpful when fishing with two or more flies. Hooks often pierce cloth mesh, and get incredibly tangled. Tippet is what we use to replace the “tips” of our leaders. Each time we change flies, we clip off the tip of our leader. After a few changes, the leader is shortened enough that the tip is thicker or heavier than intended. Hence, we tie on a bit of tippet, to restore the leader to its original length and diameter. That is, if using a 5X leader, we use 5X tippet to replace the lost portion of leader. 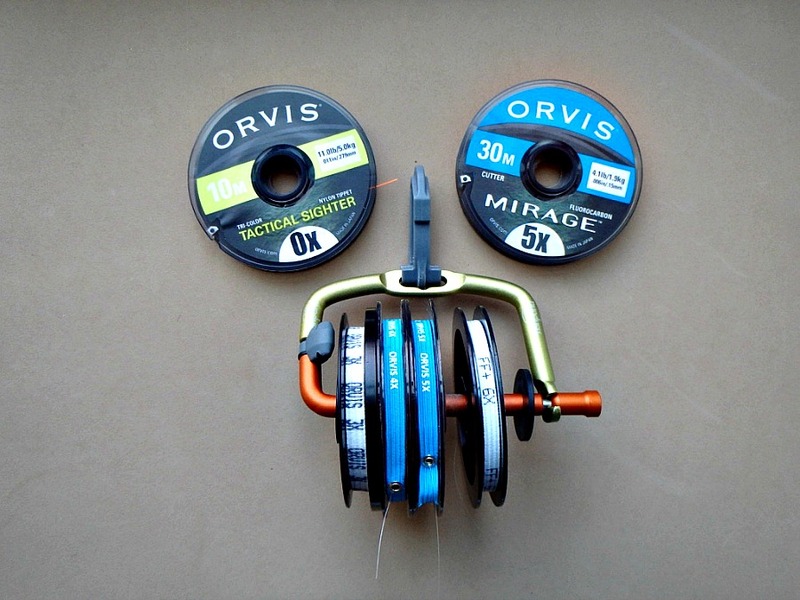 As a rule, we carry 3-4 different weights of tippet, generally 3X-6X. Most dry fly materials absorb water while floating on the water’s surface. This is markedly reduced if “floatant” is applied to the fly before the first cast. 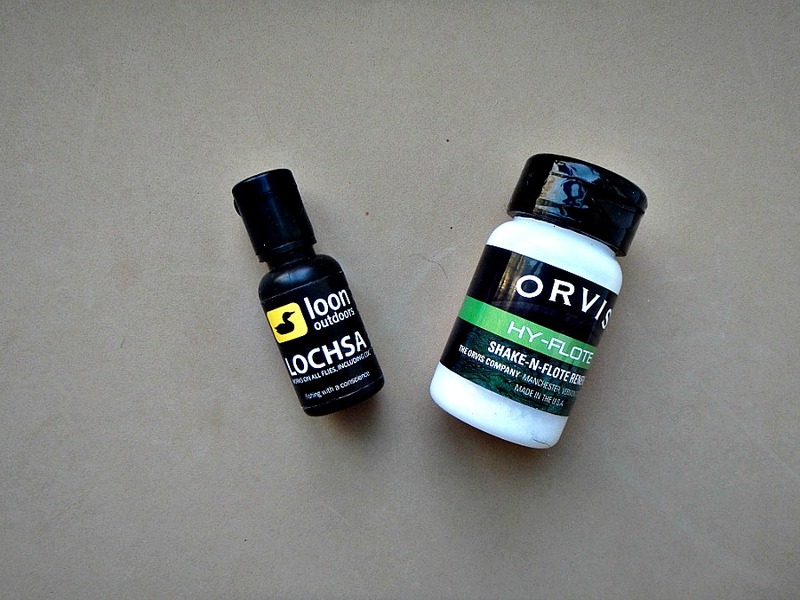 It is an oily material, and several drops easily protect the fly. Desiccants can also be used. They are a dry powder, and remove water from a saturated fly. When nymphing, we need some weight to get our flies to the stream bottom, which is where nymphs hang out. This is usually done by adding weight to the fly with a metal bead-head or wrapping wire around the hook shank. Alternatively, or in addition, a piece of shot with a groove is attached to the leader. This is done by pinching it with a hemostat or pliers. The easiest way to begin nymphing is to attach a “strike indicator” to the leader. They work just like a bobber. If the nymph is taken by a fish, the indicator moves unnaturally, “indicating” it’s time to set the hook! A large dry fly can serve the same purpose. Now that you have all this stuff, how do you carry it? For most, it is either a traditional fly fishing vest, or some sort of pack. Vests have a dozen or more pockets. 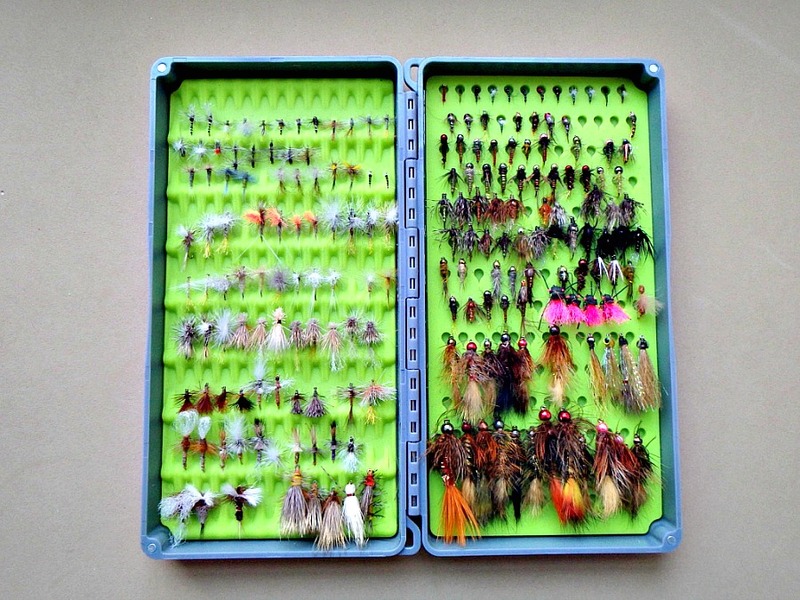 Most are on the front, and are sized for fly boxes, reels, leader packs, etc. Larger pouches are on the back, to hold lunch, water bottles, or extra clothes. Also on the back is a loop or ring for attaching a net. Packs serve the same purpose, but hold everything behind the angler. Fanny and sling packs are designed to be easily rotated to the front of the angler when something is needed. Traditional back packs provide a greater capacity, but must be removed to access their contents. Fishpond offers a backpack/vest, which as its name implies, has a vest-like front and a spacious back pack. They all do the job, and the choice is a personal one. Often, the amount of time spent during a “day’s fishing” helps determine the choice. The longer the “day”, the more stuff needed. As you continue your fly fishing journey, you will eventually begin to fish larger, deeper streams. Their rocks, uneven bottoms and rapid currents often lead “to a swim”, if not careful. The use of a wading staff, rather like a folding ski pole, provides a great deal of stability while wading. Its use prevents falls, and facilitates the access of trickier pieces of water. A day of fly fishing, especially in the West, is often accompanied by rainstorms. Trees or other cover may not be available. In addition, rain often triggers feeding activity, and you may want to continue fishing, in comfort. Thus it is often prudent to carry a rain jacket. There are jackets designed especially for fly fishing. They include pockets for fly boxes, patches to attach gear, and a loop for a net. While handy, they are often pricey. A light weight, foldable jacket of most any sort suffices. If you want to share a memorable moment with family and friends, don’t forget a pocket camera or cell phone. Cell phones also provide the ability to call for help, should a need arise. Some waders have water-proof pockets to keep them in. Otherwise, keep them in a plastic baggie, just in case of a fall and dunking! This list of suggested equipment has you well on the way to begin safely, comfortably fly fishing most any body of water. But is it enough, you ask? I think you know the answer to that question! So visit your local fly shop, it’s almost as much fun as fly fishing itself. written by Al Simpson, February, 2019.